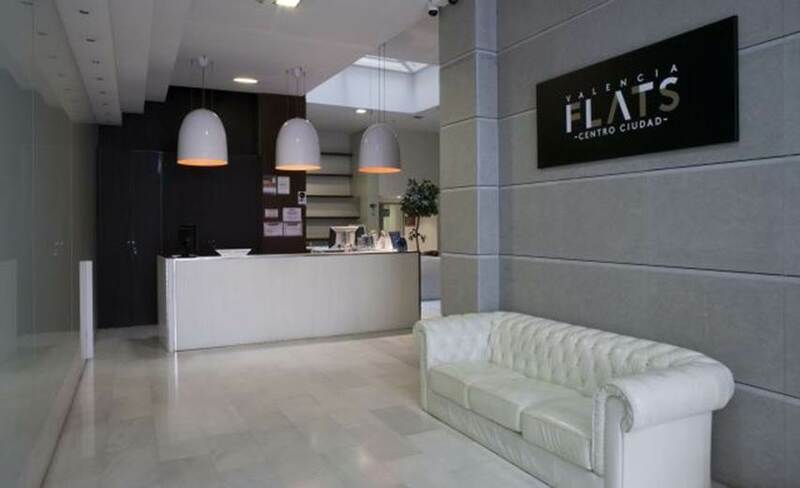 Last weekend I had the opportunity to visit Valencia and stay with Valenciaflats, a holiday apartment rental company that offers accommodations all over Spain’s third-largest city. I’ve been travelling so much lately I was in need of a relaxing weekend to catch up with my friend Alessandra, and our apartment at Valencia Flats Centro Ciudad provided the perfect place to do so. 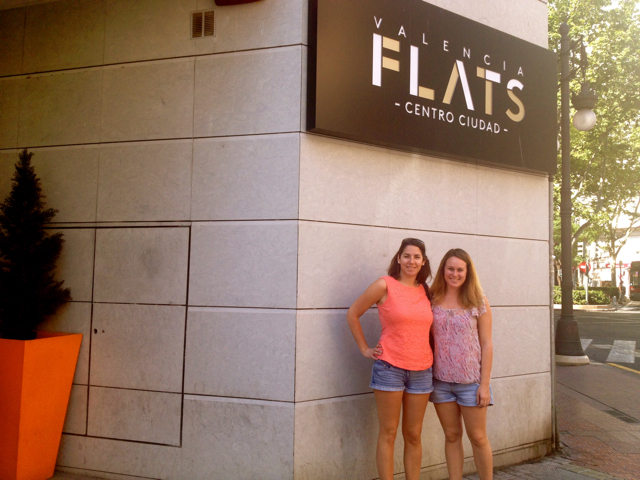 With lots of space and a hip décor, Valencia Flats Centro Ciudad was a great host for a weekend escape. Our apartment had three gorgeous sets of floor to ceiling windows that flooded the room with light and provided great city views. A half wall separated the bed from the rest of the flat, giving the space a very open and welcoming feel. The bed was a tad small for two friends, but the flat had a sofa bed, which, as Alessandra reported, was extremely comfortable. 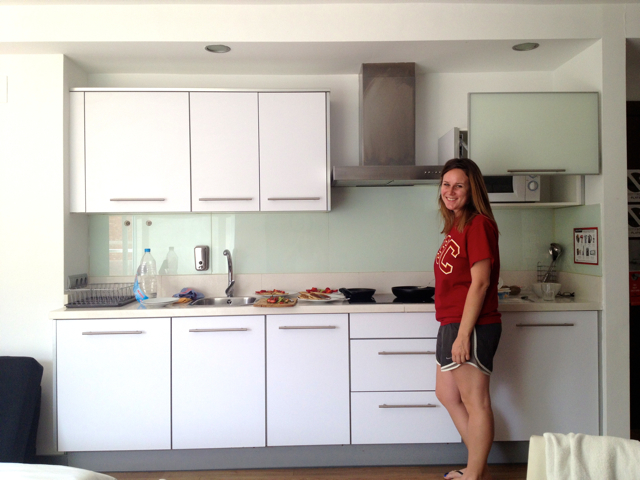 One of my favorite parts of the apartment was the kitchen with its spacious counter tops, four electric burners and came fully stocked with pots, pans, plates and more. 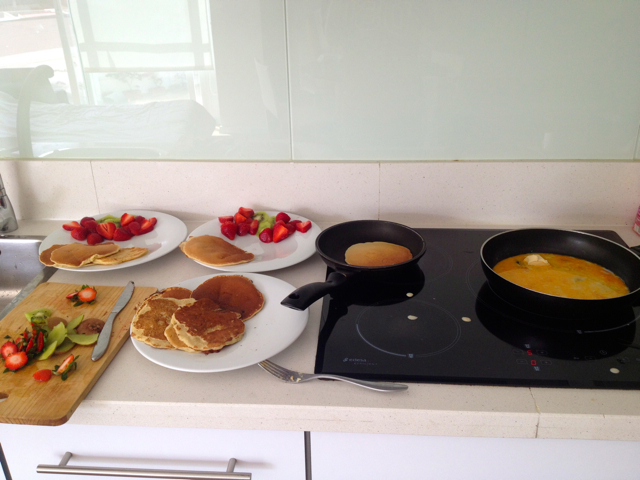 The kitchen in my apartment in Madrid is so small and seemingly always occupied by one of my 11 plus roommates, so I really appreciated the opportunity to spread out and cook a good old-fashioned American breakfast. 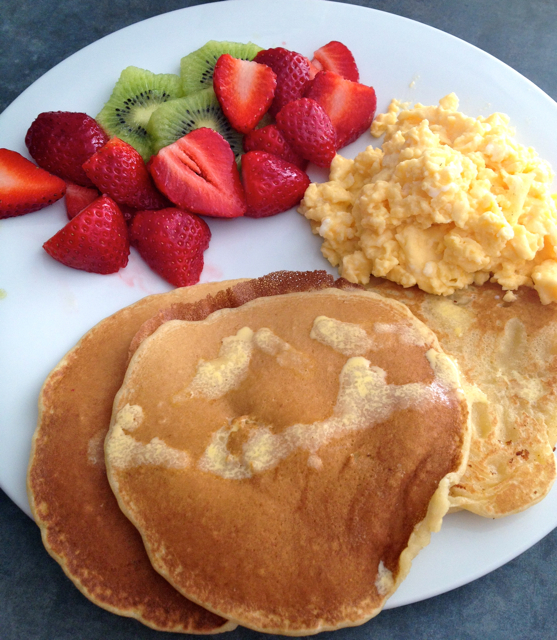 (Sorry Spain, sometimes I need a break from your jamon and tostas and to revert back to scrambled eggs and pancakes). I also want to give a shout out to the great staff who sat at reception from 8:30 a.m. to 11 p.m. and were reachable by phone 24 hours. Every single staff member I encountered was super friendly and full of great recommendations for where to go and what to see. I was a little bummed to be out of Madrid for the European Champions League finals (in which two Madrid teams were facing off), but the staff recommended a great spot with lots of local football fans to take in the action. 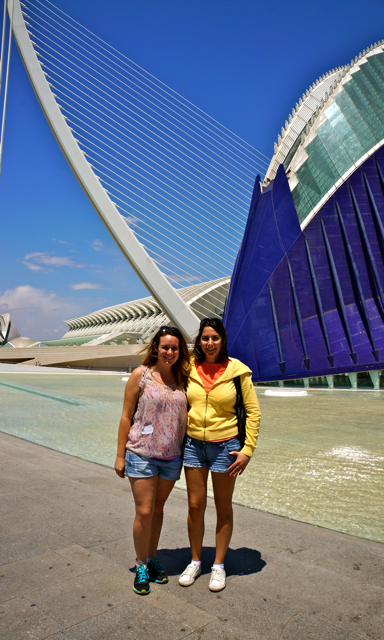 Note: if you are visiting Valencia during a big sport weekend, then Plaza del Cedro really is the place to go. 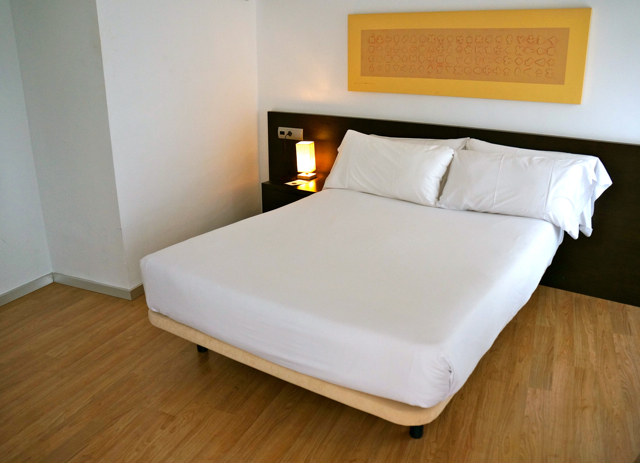 Valencia Flats Centro Ciudad also has a superb location, just a five-minute walk from a metro station that can take you to the airport, train station, beach and other locations in the city. 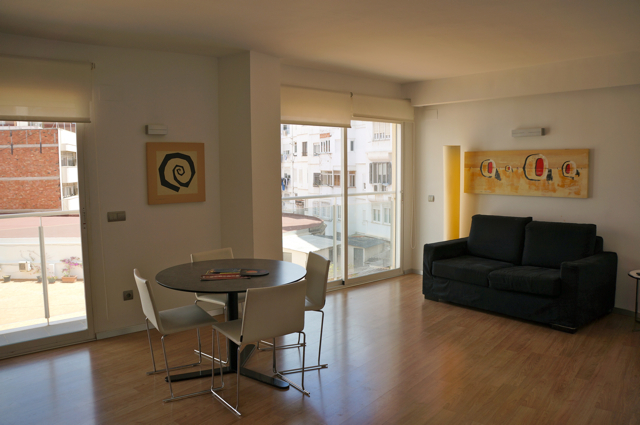 The apartment is about a 20-minute walk to the major historic sights and a 15-minute bus ride from Valencia’s star attraction, the City of Arts and Sciences. 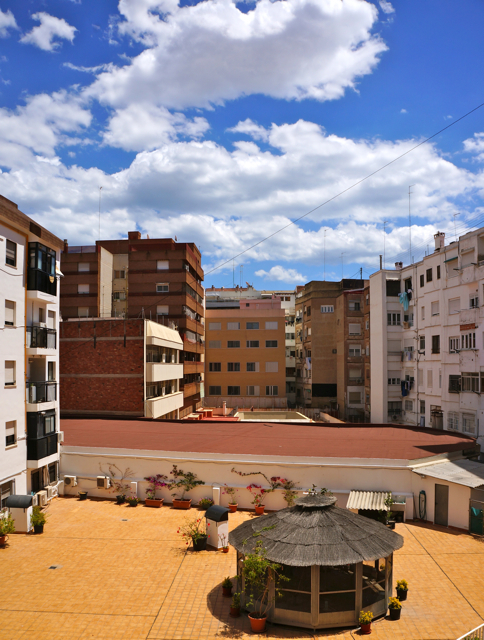 Valenciaflats offers 267 rental apartments in 12 buildings located in the city center, old town and near the beach, golf courses and City of Arts and Sciences. With highly affordable prices, Valenciaflats is a great option for twenty-something travelers like myself, especially if you are travelling in a pair or small group. For just a little bit more than a hostel, you will get privacy and a luxurious space to call your own for a bit. 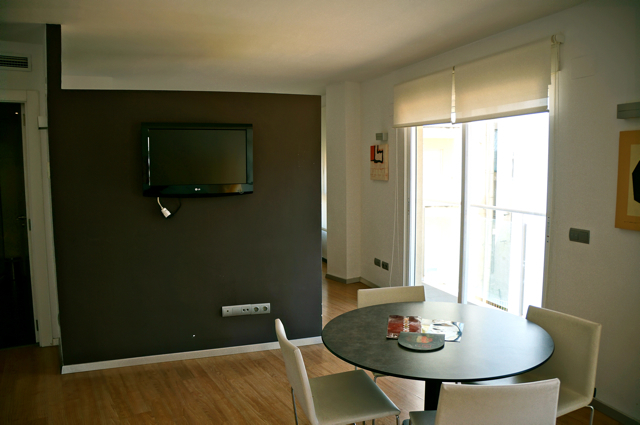 The apartments can be rented for a short getaway or long term. Headed to Valencia? Check out the Valenciaflats website for their latest deals and to book your stay. Note: I received a complimentary stay at Valenciaflats. However, all thoughts and opinions are my own.